After five weeks of untold hardship weathered by federal employees and ancillary private businesses harmed by the record-long partial government shutdown, Donald Trump caved to the Democrat’s demand to reopen for business minus any border wall funding. In the end Nancy Pelosi, speaker of the House of Representatives, outmaneuvered the president, and forced Trump into accepting the same deal on the table before the shutdown began that failed to include the $5.7 billion earmarked for building a border wall. Pelosi possessed a mandate not to compromise as Democrats were swept into power this past November in the midterm elections specifically to check Trump’s questionable initiatives. The president underestimated Pelosi’s strategic high ground and the Democrat’s ability to stand united in opposition to funding a wall on the U.S.-Mexico border, which Trump insisted was crucial to combating an artificial immigration crisis in America. Lost in all the hyperbole and rancor was Trump’s renege on the promise that Mexico would pay for his big beautiful wall. This is the epitome of a nonstarter to be trying to swindle taxpayer dollars, from Democrats no less, to fund this boondoggle. Trump’s retreat on wall funding took a toll on his presidency, as it exposed his inability to perform as a dealmaker. First he failed under a unified Republican control of Congress and then with Democrats. This leaves his signature campaign promise unfulfilled. A gaping void the Trump faithful are not willing to overlook. Meanwhile Speaker Pelosi’s reputation as a master political tactician grew exponentially. A perfect storm arose Jan. 25, forcing the novice president’s hand. As defections in Trump’s own party grew, his job approval numbers sagged and airport delays lengthened, aides informed Trump he had no foreseeable solution but to take the Democrat’s deal. 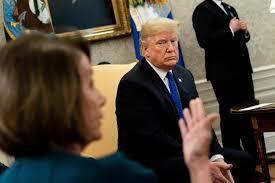 Rep. Pelosi attempting to explain to Trump why closing the government would be a foolish idea. From a messaging standpoint Trump lost the shutdown battle before it began. After a televised meeting in December with Pelosi and Senate Minority Leader Chuck Schumer, there was no escaping Trump’s declaration that he would be “proud” to shut down the government. Spin as the president might, no one bought it was anyone’s fault but Trump’s for the shutdown mess that directly impacted 800,000 federal workers. The White House had no plan for how to navigate this choppy water, and Trump again showed a shocking lack of empathy and discipline in handling his own manufactured disaster. 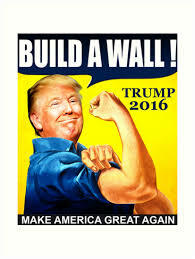 The mantra of “build that wall” was a punch line. A way for Trump to get his crowd going at rallies. “And who is going to pay for it” a rhetorical starter. Now it’s an albatross around the adminsitration’s neck. 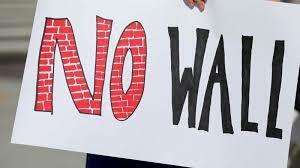 Instead of simply agreeing to a border security package that utilized a combination of smart technology, drones, motion detectors, cameras and increased border patrol officers – Trump has made such a fuss about erecting some medieval wall he is boxed in by his base with no escape. Complicating the optics on the shutdown was the administration being seen as out of touch with ordinary Americans. Wilbur Ross, secretary of commerce, wondered aloud in a CNBC interview why federal workers were having to visit homeless shelters and food banks after missing two paychecks instead of just taking out a loan. Trump’s terrible, horrible, no good, very bad Friday got off to a whiz-bang start as confidant Roger Stone was arrested in a pre-dawn FBI raid at his Florida home. He was charged with obstruction, false statements, and witness tampering as part of special counsel Robert Mueller’s investigation into Russian meddling in the 2016 election and possible Trump campaign collusion. Trump still found a way to make things worse by insisting he had not conceded after news outlets, including Fox and other right wing favorites, bashed the president for caving. With the wounds from this 35-day standoff still fresh Trump newly threatened another shutdown in three weeks if the boy king didn’t get his border wall. This catastrophe of a presidency begs the question, how is all that “winning” Trump promised working out for everyone in America? Tired of it yet? I’m not sure I can take much more.